Theosophy teaches – an Absolute Infinite Omnipresent Divine Principle which is the source and substratum of all. It is the Causeless Cause and the Rootless Root of all. It is impersonal, immutable, and unconditioned. It is the “One and Only” eternal Reality. It is really beyond all definition and description but is THAT which is referred to in Hinduism as Brahman or Parabrahm, in Buddhism as Adi-Buddhi, and in the Kabbalah as Ain-Soph. It is not a Person or Being of any kind. It would be misleading and misrepresentative to speak of It as “God” since It is not any type of God. It can be better spoken of as the infinite and eternal ENERGY and CONSCIOUSNESS which is all and in all. Theosophy teaches – the divinity and unity of all life. Every living thing is divine and spiritual in its innermost essence, which is its true Self. In the highermost part of our being, our Higher Self, each one of us literally is the Brahman referred to above. Theosophy teaches – that there are many souls but only one spirit. We are all individual souls, yet in the highermost part of our being we are all literally one and the same. We do not have individual spirits. Souls are many but spirit is ONE. “Just as one and the same sun shines over every body on this earth, so one and the same Spirit shines over and illumines every soul.” (Krishna in the Bhagavad Gita) This again is the Brahman mentioned already. Theosophy teaches – that the Universe is a cyclic and periodical manifestation. It comes forth into existence from the Divine Principle by means of evolution (not creation) and remains and evolves over an incredibly lengthy period of time. Then it gradually disintegrates and disappears, everything being reabsorbed into Brahman. Eventually, after the same duration of time for which it had existed, it is reborn, on a higher level than before. Theosophy teaches – that the Universe and everything in it is in the constant process of evolution. The evolution of matter and of objective forms is undeniable but the most important aspect of evolution is the evolution and gradual unfoldment, advancement, and development of the unseen inner entities (or souls) through those material/objective forms and bodies. Man descended as a “Divine Spark” into matter and has worked his way up into the human kingdom by passing through the mineral, vegetable, and animal kingdoms in long ages past. Now he is evolving back up towards the consciousness of his true spiritual nature. 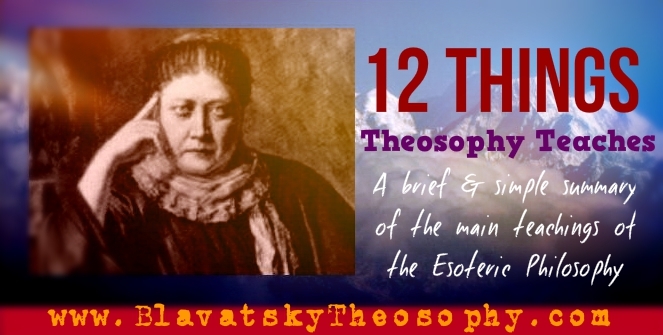 Theosophy teaches – that human beings actually possess a sevenfold nature. We are each comprised of seven “principles” or components. Three of these are immortal and endure from lifetime to lifetime, while the other four last only for the duration of one lifetime and are new with each successive birth. The Higher Triad consists of (1) Our Divine Self; pure eternal Spirit – called Atman in Theosophy (2) Our Spiritual Soul; the vehicle for the radiation of the light of the Spirit – called Buddhi in Theosophy, and (3) Our individual human soul, which is the same thing as the mind; this is our Ego (in the true sense of that word), our “I” or permanent individuality, the part of us which reincarnates – called Manas in Theosophy. The Lower Quaternary consists of (1) Our passional nature; the element of desire figuratively described as the “animal soul” – called Kama in Theosophy (2) Our vital nature; the life force or life energy which actually keeps us alive and in physical incarnation – called Prana in Theosophy (3) Our astral body; the subtle and unseen blueprint, framework, and mould upon and around which the physical body is built; it can be described as our “energy body,” the vehicle through which Prana flows to the physical body – called Linga Sharira in Theosophy, and (4) Our physical body; which is really nothing more than our outer shell and the vehicle during life for the manifestation of all the other principles – called Sthula Sharira in Theosophy. Theosophy teaches – that reincarnation is the means for the evolution of the human soul. The physical body and personality we have today is only one of many which we have occupied throughout our long evolutionary journey. In the whole scheme of things, this life we are living now amounts to only a chapter, or even only a page, in the whole “book of lives” of our soul. The circumstances, situations, and conditions of each lifetime were formed by our own previous actions, whether we were aware of it or not. In the past we created our present and in the present we are creating our future. No-one can avoid or escape reincarnation, since it is the Law of Nature. The cycle of birth, death, and rebirth only comes to an end when the individual has attained to true spiritual perfection, freedom from all desire, and conscious reunion with the Divine. This is called Nirvana, Moksha, or being reabsorbed in Brahman. Theosophy teaches – that all of life is governed by the Law of Karma. Everything in the Universe is under the sway of Karma. This is the unfailing, unerring, incredibly far reaching Law of cause and effect, action and reaction, sequence and consequence. What we sow, we will eventually reap. What we reap, we have previously sown. This is the way, the means, and the method whereby the Universe maintains its harmony, balance, and equilibrium. Universal equilibrium would be impossible unless the Great Law was constantly adjusting action to reaction and reaction to action. It is a perfect and unalterable Law, impersonal and just. In reality there is no injustice. Each one of us gets exactly what we deserve, for good or bad. The Law of Karma is the law of self-created destiny. Karma and reincarnation are inextricably linked…you can’t have one without the other. Theosophy teaches – that what we call “death” is actually only a transition, a change of state. Our true being can never die. When so-called death occurs, we leave behind on earth our physical body, our astral body, and the force of Prana. We then enter into what could be called the “astral plane,” the psychic atmosphere which most closely surrounds the physical plane. Theosophy calls it Kama Loka. We are unconscious there, in a type of dazed and sleeping state, and undergo the process of separation of our lower and mortal nature from our higher and immortal nature. When this is completed we say that the “second death” has occurred. The principle of Kama and the lower, earthly, and sensual elements of Manas remain behind in Kama Loka as a type of senseless and soulless shell and eventually fade out and disintegrate. Meanwhile, the soul enters into the “gestation state,” a period of profound unconsciousness and inaction, before eventually waking into the Heaven state. This is called Devachan in Theosophy. This is not a place or location but a state. It is the Heaven of the individual’s dreams, created unwittingly out of their own consciousness, and perfectly representing the type of afterlife they had believed in, thought about, and expected, during life. The Devachanic state lasts in exact accordance with the amount or force of positive Karma accrued by the individual during the last lifetime. Then reincarnation inevitably takes place. Very materialistic and sensually oriented souls often reincarnate quite quickly but for others the period of Devachan may last decades, centuries, or even thousands of years. Theosophy teaches – that practices such as spiritualism, mediumship, and channelling are dangerous and detrimental to both the living and the dead. Departed souls cannot see us. Apart from a very small number of exceptions, it is impossible for a departed soul to communicate with those left behind on earth through a medium or even to see or have any knowledge whatsoever of what is going on here. Devachan would not be a state of perfect bliss, peace, and joy if the individual there was still connected with the physical plane in some way. Nature is kind enough to create an impassable chasm between the heaven state and the earth state, so that those who have passed on are entirely out of the reach of physical existence and of individuals on the physical plane. The main exceptions to this rule are people who have committed suicide, people who have been murdered, and those who have died a violent death. They remain in the Kama Loka for the remainder of the duration of the lifetime they had been destined to live on earth. It is possible for mediums and channellers to make contact with them but this is spiritually unlawful and can lead to seriously dire results. They must be left in peace and allowed to proceed unhindered on their eventual upward way. It is mainly the senseless and unensouled “shells” left behind in Kama Loka which are successfully contacted and connected with in mediumship and channelling. Because the shells retain a degree of memory, they are able to automatically and blindly recite and repeat certain details and pieces of information. People are deluded into thinking they are communicating with the real person whereas in fact it is only their “psychic corpse,” the cast off remnants of the old personality. Spiritualism, mediumship, and all forms of psychic channelling were condemned and opposed by the wise spiritual and philosophical traditions throughout the ages, most especially in India and the East. Theosophy teaches – the vital importance of altruism, unselfishness, compassion, and living to help and serve others. It maintains that Universal Brotherhood is not merely a noble and lofty ideal but is eternally a fact in Nature. All is one because the ONE is All. Therefore it is selfish if we live unto ourselves alone. We are all part of the whole and there is no separation in the Universe. Personal desire, ambition, greed, and lust are all misguided forms of selfishness and it is selfishness which is the great curse of humanity and the cause of human suffering. The Bodhisattva ideal – self-sacrifice and renunciation of eternal bliss in order to always remain on earth as a selfless and effective server and helper of the human race, seeking no personal reward – is viewed very highly in Theosophy. Theosophy not only permits but actively encourages freedom of thought, freedom of belief, and spiritual and mental independence. To learn and discover more, please click here to view our list of over 300 articles relating to Theosophy and the Theosophical Movement. Is there any reference in HPB,s works to the concept of group soul in animals? I’ve found some Google reference to it, but it was attributed to Charles Leadbeater, as an insight garnered from contact with a Master. Does this idea have a deeper historical connection within Theosophy? So it’s taught that all things, lower Kingdoms of Nature included, possess the Monadic Essence of Atma and Buddhi (which are purely spiritual and universal, non-individual Principles) but that this Monadic Essence does not become an *individual* Monad until after animating, vivifying, and gaining experience of, all the necessary forms and embodiments of the mineral, vegetable, and finally animal kingdoms, the Higher Manas principle emerges, the Higher Manas being the individual self-consciousness, self-conscious individuality, the individual reincarnating human soul. Then the Monad has become Atma-Buddhi-Manas. As you can see, it’s a justifiably complex subject and there is more to it than we can briefly summarise in a comment like this but you are encouraged to do your own reading and study about it. As for the Leadbeater and Besant teaching about animal “group souls,” it has a strong basis of truth but some of the embellishing details seem quite unlikely when contrasted with everything HPB and the Masters have said on this and other subjects.